What made you decide to stay at the Grand Residences Riviera Cancun? We are travel lovers. We love to travel, and we love high end travel. When we had a baby, we wanted to continue with high end resort experiences, but we wanted to be realistic. We knew we couldn't just pick a place that was beautiful, since it would inconvenience us in the end if there weren't proper amenities for our son. We did a lot of research, and weren't finding a good combination of high-end and family-friendly resorts in our price range of $500-600/ night. We finally stumbled upon the Grand Residences Riviera Cancun. We love traveling to Mexico - it's a relatively easy (and direct) flight with a little one, and on past trips we had noticed that the Mexican people seemed very warm, friendly and comfortable with kids. We were 100% correct - we loved it. We initially vacationed at the Grand Residences Riviera Cancun when our son was 9 months, and we chose to return to the same resort one year later because everything felt so easy once we were there, which is a lot to say when you're traveling with a child. The luxury, residence style rooms really appealed to us too. Both times that we stayed, we had one bedroom apartments with a full kitchen, washer and dryer - when traveling with a baby or toddler, having those amenities is hugely beneficial. It felt like we were staying in a beautiful home - there's no cutting any corners. In addition, we never felt trapped in a tiny hotel room once we put Rye down for the night. We could have dinner at the dining room table, or on the balcony, or relax in the living room. And kids aren't an after thought. 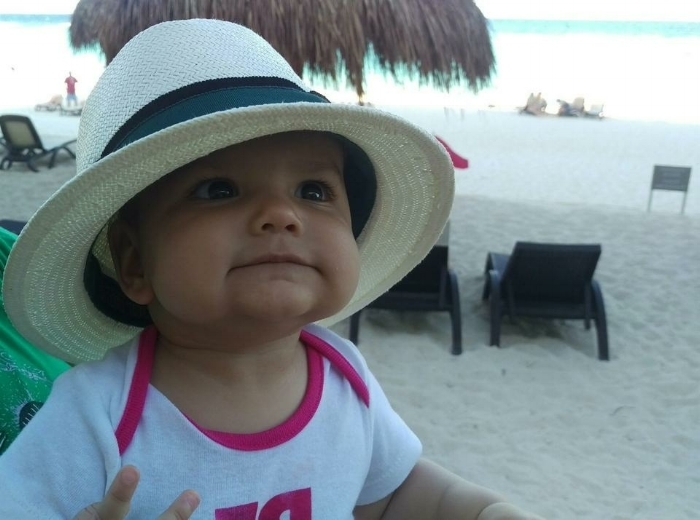 Grand Residences Riviera Cancun definitely goes above and beyond for young families. They provide a pack and play crib, nicely made up with a folded blanket and a little pillow. They also provide a diaper genie, and a high chair in the suites - all for no extra cost. And on the first night, they give each child a gift box with a teddy bear. We chose to go back with Rye at a year and a half in large part because, unlike many other resorts, Grand Residences allows children under 4 years of age to visit the Kids' Club, accompanied by an adult. It made us feel like our son had something special to do that he loved; like he was on vacation too. Overall, the resort really hits the ideal combination of being a vacation for the parents that kids also enjoy. Did you use the resort's transportation services? Yes. The airport transportation really demonstrates the resort's attention to the little things. They picked us up and dropped us off to the airport in a lovely, air conditioned SUV, complete with a car seat. (Editors note: Grand Residences Riviera Cancun provides complimentary luxury round trip airport transportation with all bookings made through its website). What room type did you stay in with your family? Did it meet your family's needs? Last year, we stayed in a penthouse Master Suite one bedroom with private pool. This year, we opted for a Master Suite, but without the private pool. With a baby that naps and nurses often, having a private pool was wonderful - we felt like we got to maximize vacation time. As a toddler, it wasn't an inconvenience to transport ourselves down to the main pool. In fact, Rye has always been a social kid. He loves watching other children and interacting with others. So using the resort pool was preferable, in some ways. All Master Suite rooms are exactly the same - with or without the private pool. But the penthouse Master Suite steps out to a gigantic private fenced terrace, with a patio table and chairs, a pool, a hot tub, and a jacuzzi bathtub. (Editor's note: all Master Suites have private terraces with Jacuzzi bathtubs). Whenever we share a room with Rye, we insist on staying in a one bedroom suite, so that we have a separate space to relax after he's asleep. Although we shared the bedroom with him, we made a partition between the crib and our bed so that he would not be able to see us if he woke during the night. We were able to make one from the couch cushions stacked vertically, and that worked well. The Master Suites also have a full kitchen and washer and dryer. Did you make use of those features? Absolutely! The washer and dryer were nice features, but the kitchen was the real draw. Although we would go to the resort restaurant for the breakfast buffet, it was great to have the kitchen to feed our toddler at other times. We would feed Rye lunch in the room, which I was able to pull together from the morning buffet and bring back in a paper cup and put in the fridge - things like smoked salmon. Because he's a young toddler, lunches aren't a big affair, so this worked well. Rye is often a bit tired and hyper at dinner time, so having the option to feed him in the apartment suite rather than in a restaurant was great. I kept things super simple. I froze a container of pesto and put it in a small cooler, which I stored in my suitcase. I also packed a box of Ancient Grains quinoa and corn pasta. I cooked up a big batch of pasta at the beginning of our trip and kept it in the fridge, and Rye was happy to eat the pesto pasta for dinner throughout our trip. Next time, I'd bring along a bag of prepared chickpeas as well to throw in the pasta for extra protein. Beyond the kitchen, the suites come equipped with high chairs for young families. Having the dining table and high chair made feeding Rye much more comfortable. 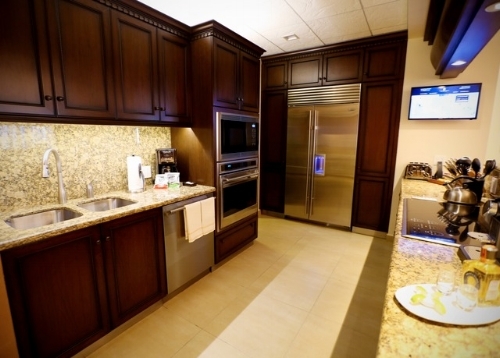 You make having a full in-suite kitchen seem heavenly. I'm always worried that, with a kitchen, I'll end up grocery shopping, cooking and cleaning every night, which is the opposite of a vacation for me. Well, rooms do get cleaned twice a day, and the cleaning staff will run the dishwasher for you. We tidied up after meals, but it was fairly easy, especially since I just cooked a big batch of food one evening. Also, there is a great marketplace on site. Essentially, it's like a New York City bodega, which is well stocked if you don't want to go off-site. For example, we forgot baby soap and shampoo, which we were able to buy at the market. You can also pick up fresh milk, fresh eggs, and fresh vegetables - a small selection, but things to get you through if you wanted to do some cooking in your room and didn't want to leave the property for groceries. Were there any downsides to the room? On both stays, we used the outdoor jacuzzi bathtub to bathe Rye, rather than the indoor bathtub, for two reasons. Obviously, it's nice to be able to do the bath outside - my husband would go in with my son, and the bath ritual was actually a really nice part of our vacation. The indoor bathtub, while beautiful for an adult, was super deep with a step stool for adults to get in, as well as steps inside the tub. We found it impossible to imagine getting Rye in and out safely or comfortably - it felt super awkward. (Editor's note: Though all Master Suites have outdoor jacuzzis, only some Junior Suites have jacuzzis on the terrace). What did you think about the property at Grand Residences Riviera Cancun? The resort was immaculate. It was also a nice size for us - large enough to have variety in terms of activities and areas to explore with our son, but all within an easy walking distance. The guests are mostly families and older couples, so its not a party scene at the resort. That said, the resort does host daily games and live music at pool. For example, there is an entertainment employee who comes out and does pool bingo with a microphone. My husband hates this sort of thing. Whenever the games would start, he would retreat - but it is easy to step away for peace and quiet. The beach is just off of the pool area, and there were definitely plenty of quiet areas. The music varied, from really beautiful classical guitar one day to dance music the next, but it never got to the obnoxious level. It would be for a short period of time each day, and that was it. Did the music and activities ever disturb your son's sleep? No, we had a room away from the pool area. That said, there are rooms facing the pool, so it's worth talking with the resort prior to arrival to ensure your room is a quiet one. What did you think about the beach and pool at Grand Residences Riviera Cancun? Grand Residence's stretch of beach (like many resorts in this area) is not a swimming beach, but we were fine with that. We were content to spend time sitting on the beach looking out at the water and playing in the sand with Rye. We also did a lot of pool swimming - the resort has a great kiddie pool section, and we also took Rye into the adult pools and hot tubs - which were not super hot. So, the lack of swimmable beach wasn't an issue for us, though it could be for other people. If you're looking to be outside all day with your kid, you might find it tough.There is not a ton of sun cover around the pools and beach area. There are umbrellas, but otherwise not a lot of roofing or shade. The resort does have areas off to the side of the pool with cushioned beach furniture with slated rooms for partial shade. At Rye's age, the outdoor couches were more comfortable than lounge chairs anyhow. You're a nutritionist and a foodie - what did you think of the dining at Grand Residences Riviera Cancun? The food is all high quality and great. I will say that room service - which we had to partake of more than we would have before traveling with Rye - felt limiting after seven days. Our family is vegetarian - and yours is gluten-free. I've noticed when traveling in Mexico that, with dietary restrictions, choices can be limited. Absolutely. I was thinking - if I could order anything from the menu, perhaps it would be different. But when there are only two dishes that meet your dietary needs and seem interesting to you, and you order them again and again, it starts wearing. Was the resort toddler friendly? Extremely toddler friendly. Rye loved it at Grand Residences Riviera Cancun. That being said, I think the resort will become more appealing as our son ages. The Kids' Club has daily activities, like ceramic painting and bracelet painting, which all the older kids seemed to enjoy. For a toddler who isn't yet able to partake in the activities, the Kids' Club is really about the play space. My one complaint about the Kids' Club is that it has only one teeny box of toys for toddlers, many of which were broken or missing pieces. On days where there were more than two toddlers playing with the toys at the same time, they'd be looking around wondering "what can I play with?" That said, Rye's a super active kid, and had a blast running around the room, flopping into the beanbag chairs, and playing with the balls. The Mega Bloks were also a big hit. The facilitators and babysitters are really engaged with the kids, so I'm sure they'd find things to keep toddlers entertained beyond the small box of toys. Did you have to pay to visit the Kids' Club with Rye? No, the Kids' Club is free to visit with an accompanying adult, which is nice. Rye is a kid who needs entertainment, and even a 30 minute visit to the Kids' Club was enough to break up our mornings. He wakes at 6:30am and goes down at 12pm, and there is only so much pool time that you can do with a toddler. It was nice to be able to go into the Kids' Club for a short visit to run around or play with blocks, without having to pay. Any potential safety hazards for a toddler? The pool area was slippery, which is a bit nerve-wracking with a toddler. We spoke to one mom staying in a room with a private pool whose toddler slipped and hit his head on their pool deck. You stayed in a room with a private pool last year - beyond the slippery deck, is it safe for toddlers? For example, if the pool fenced in, or is it straight walk out from the balcony? The private pools are fenced in - yes. You used a babysitter on your trip. Did you arrange the babysitter through the resort? Yes. They charge $20/hr, which is what we pay our babysitters in New York City, so it felt reasonable to us. The resort recommends booking babysitters in advance. I made our booking a week prior to our trip. They were flexible with schedule changes, though. Once at the resort, we added a few extra days, and tweaked times, never with any issue. It's worth noting that the resort wasn't at full occupancy, though they were pretty busy. We stayed at the Grand Residences Riviera Cancun in early February. At that time, the residence had three or four sitters available. What was nice was that we had the same babysitter both years. Obviously, there are no guarantees, but they do try to provide consistency when possible. What did you adults do with your kid-free time? Did you two use the spa, or take part in the bicycle tours or cooking classes? I'm sure there are more adventurous parents, but when we had those four and a half hours to ourselves, we wanted to do NOTHING. It even felt that two hours of spa time would take away from our time of just sitting on the beach with a margarita and staring at the waves. That was literally our priority. We'd order lunch and margaritas; read; listen to music on our headphones; walk on the beach; and later grab a free espresso from the lobby bar. Did you take part in any of the resort's activities with your toddler? For example, the catamaran, or tea time? We didn't do any of that, only the Kids' Club. Families did take their kids to tea time, but we weren't sure it would be a draw for our toddler. One thing that we did do off-property that was super great was the Croco Cun Zoo - it's a conservationist zoo. It was a really easy 15-20 minute cab ride away. We didn't do any advance booking, just had the front desk call us a taxi. This was a phenomenal toddler activity close to the hotel - particularly in the morning pre-nap. Very easy, very fun. It's incredibly hands on, with lots of animals to feed and safely touch - including crocodiles, turtles and hairless Mexican dogs. They provide tours for everyone who visits - our tour consisted of us and one other family. There were also these wild monkeys that would bonk the deer on the head. Rye still talks about it. Any downsides to the resort or room? (long pause). The only things - and they are so minor - not many toys for toddlers in the Kids' Club; the limited room service menu; and an occasional lack of follow through from the concierge service. Each room is assigned a personal concierge, and ours was very sweet and very friendly - she'd see us on the beach and check in with us, or bring us a special snack. But occasionally we'd make a request, or have an inquiry, and we wouldn't hear back. I don't think it was intentional - I think the heart is there, but I do think there is some tightening up that needs to happen. It sounds like you would recommend the Grand Residences to other families traveling with babies or toddlers? Yes, absolutely. The babysitters are phenomenal, and the policy of allowing children under 4 years to visit the Kids' Club accompanied with a parent or sitter is a real draw. The rooms are beautiful and super well appointed, especially for little ones' needs, and the resort itself is gorgeous. And of course, no matter how wonderful the resort, it would never feel worth it if it was a total schlep to get there. From New York, it's a relatively easy 4 hour flight and an easy car drive from the airport to the resort (about 25 minutes). Even with a no nap day, the trip felt easy, which is saying a lot. Any suggestions for families looking to stay at the Grand Residences Riviera Cancun? I'd absolutely recommend a Master Suite - whenever we travel with Rye, we insist on a suite so that the adults have an indoor and outdoor space to relax after the little one is put to sleep. Having the fully appointed kitchen to make meals for our toddler was great, as were the in-suite washer and dryers. (Editor's note: Grand Residence Riviera Cancun's Junior Suites do not have separated sleeping and living spaces, though all have private terraces for parents to retreat when their children are asleep. As well, Junior Suites have kitchenettes, with a mini fridge, coffee maker and microwave, rather than fully appointed kitchens). The resort's babysitters are phenomenal - we highly recommend using the babysitter service for some adult time during nap time hours.